Visit Bike online at Bike.com for an enormous selection of bicycle parts, accessories, apparel and more! Bike carries brands such as Aardvark, ABI, Accelerade, Acros, ACS, Action Tec, Adidas, Barnetts Bicycle Institute, Bell, Bellwether, BEV Intl Corp, Bicycle Research, Larabar, Lazer, Lezyne, Lifeline, Light and Motion, Lightning, Lizard Skins and many many more. Bike.com also puts its customers at ease by providing great deals on bike maintenance and repairs. 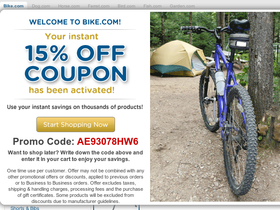 Stop by 58Coupons.com for Bike.com coupons, Bike.com discounts and Bike.com promotions. Enjoy free shipping with your purchase of over $69 or more at Bike.com! This is a limited time offer. Some exclusions apply, click link for details. Purchase Maxxis Highroller tires at Bike.com and save up to 20%! Click link and shop. Shop at Bike.com and enjoy up to 10% savings or more on Rockgarn Leg Armor knee pads. Click link and shop. Shop at Bike.com and enjoy Rockgardn Fate gloves at a discount of up to 10%! Click link and save.